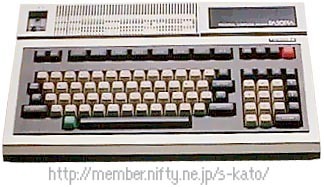 This is the first home-computer made by Toshiba and was quite powerful for 1981 : 64k RAM, 80 columns, 640 x 200 high resolution and large expansion possibilities. There were two models : the PA7010 with the T-BASIC built-in, and the PA7012 with the OA-BASIC built-in. The advantage of the OA-BASIC is that it can use indexed sequential access methods to handle files, and has an automatic load / run function for launching programs. It can also handle Chinese characters directly within BASIC. Finally it has a Terminal mode. see more Toshiba PASOPIA Ebay auctions !